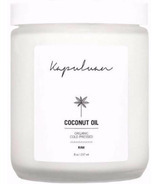 Kapuluan Coconut Oil is 100% Organic and made from only the freshest coconuts which are sourced from rural, organic farms in the Philippines. 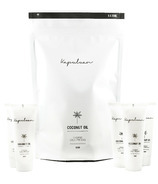 Kapuluan's Hand Pressed Coconut Oil is of the finest quality, with a wide range of health and skincare benefits. 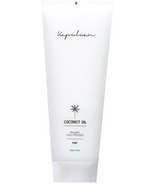 Kapuluan coconut oil is all natural, pure, and exceptionally high grade for beauty and Personal Care. Silky smooth with a beautiful subtle coconut aroma, the oil absorbs quickly and is highly moisturizing, while rich in nourishing Vitamin E and antioxidants. 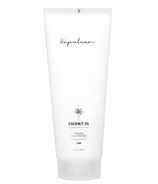 Kapuluan coconut oil is a foundation for healthy, beautiful skin, and does not harm animals or the earth. Our hand pressed small batch coconut oil is made on the farm and without the use of large industrialized equipment, allowing small farming families to hand make our coconut oil in a healthy and fun environment. The process in making the oil is extremely simple, avoiding heat, and producing the most beautiful, finest quality Coconut Oil in 1 hour.